Determining the installed transmission type from VIN alone has traditionally been hit-or-miss. Not knowing the transmissions installed in the vehicles in your inventory can present a number of challenges. Unfortunately, the existing VIN standards do not require OEMs to encode transmission information directly in the VIN. However, due to a gradual decrease in transmission options over time, this is becoming easier. This article explores four common questions about VIN decoding transmission data, and provides suggested solutions for significantly increasing the match rate of decoded transmissions in your inventory or data feed. 1. Why can't I determine the transmission type for my VIN? In Part II of our VIN Decoding 101 Guide, we explained that positions 4-8 of the VIN are encoded with a number of valuable vehicle details, including engine, body type, restraint system, and GVWR. Some OEMs also use this section of the VIN to capture transmission information. Unfortunately, other OEMs use the same 10-digit VIN patterns for Automatic and Manual transmission vehicles, meaning that VIN alone will not be enough to determine the vehicle's transmission type. 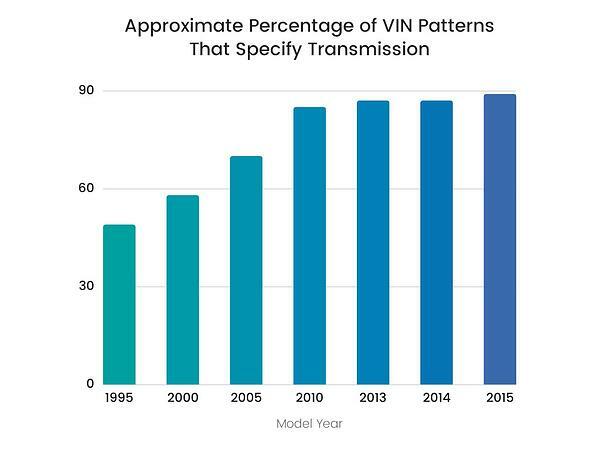 The good news is that the number of transmission-specific VIN patterns is on the rise. This is largely due to a decrease in the number of vehicles that can be equipped with a manual transmission (See our post on the Demise of the Manual Transmission). 2. How often will I be able to determine transmission using VIN alone? Due to the gradual decrease in manual transmission options for new vehicles, your chances of being able to determine transmission from VIN alone are much better for recent model years than for older vehicles. The table below shows the percentage of VIN patterns that reference a single transmission over the years. Note that percentages of actual inventory with a VIN pattern tied to a single transmission may differ from the numbers below. 3. For which makes will I be able to determine transmission using VIN alone? For some makes, the VIN is almost always enough information to determine transmission. Conversely, there are a few makes for which VIN is frequently not enough (fewer than 50% of vin patterns). Most makes fall somewhere in the middle. 4. How can I improve my transmission match rate? If you're looking to improve your transmission match rate beyond what can be obtained by using the VIN alone, you'll need to obtain and use additional data from your vehicle inventory data source. This could mean asking your employees to gather some additional vehicle details if your inventory data is captured manually. Or, it could mean polling additional fields from the DMS, or speaking to your 3rd party inventory data provider if you're procuring data through these means. When it comes to decoding transmission details, transmission type is the most helpful (and most obvious) datapoint you can try to capture and use along with VIN. If you could obtain a simple "Manual" or "Automatic" for all of your inventory data, this would take your Model Year 2010-2015 match rate from ~80% to ~99%! Even if you could only obtain a Manual/Automatic designation for a portion of your inventory, this could still drastically reduce the number of vehicles for which you cannot decode transmission details. Once you have VIN + transmission type, you should be able to rely on extended VIN data to tell you that a Manual transmission vehicle with VIN XXXXXXXXXXXXXXXXX has a 5-speed manual, or a 6-speed manual, etc. There are very few VIN patterns representing vehicles that can be configured with more than one type of Automatic transmission, or more than one type of Manual transmission. Finally, if you can't include transmission type in your decoding process, the next two most helpful datapoints would be Manufacturer Model Number (generally only available via DMS for new vehicles), and trim level (for example, L, LE, or XLE). Considering these two fields will increase your match percentage by about 5-6 percentage points for vehicles from the early 2000s, and by a couple percentage points for more recent model years. DataOne's VIN Decoder API is designed to take a broad spectrum of data as input, including VIN, OEM codes, and trim, as well as any other vehicle descriptors like "manual" or "automatic" that you may have access to. These inputs are then used to provide back a single transmission, as well as a single vehicle style match whenever possible. This increases the accuracy of your data and vehicle listings, and their perceived value to potential customers, while reducing the need for manual verification of inventory on your part.